NOTES: We guarantee REPLACEMENT of defective items. If you received defective product, please contact us. brightness mode control. Simply tap the power button and quickly adjust brightness and color to your liking. Lighting memory function recalls your brightness or color setting next time, so you immediately get your preferred setting. charging port gives you charging simplicity and flexibility.Easily charged from computer power bank or mobile phone. on cool white mode, tap twice to glow warm yellow light, tap third to turn off. Long touch: when lamp on any color modes, long press touch switch to change the brightness. 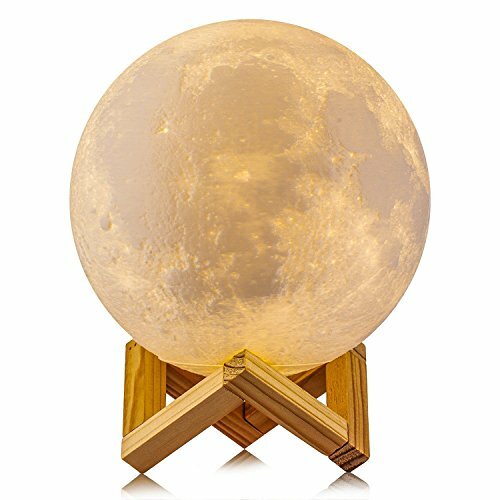 【Good Mother's Day Gift and Decorative Lamp】The moon has been a divine and enchanting symbol, it brings you lucky and happiness. So it is a great gift for your mom, dad, friends, kids and families on Christmas, mother's day holiday birthday party wedding,or anniversary. A good ambient light for room decor, kids bedroom, living room, dining room, office, college dorm. And a relaxing toys for kids. 【Rechargeable Night Light】 Bulit-in rechargeable battery provides 4-20 hours illumination depending on brightness. Standard USB charging port for PC, charger and mobile devices, etc. USB-chargeable for use anytime, anywhere. The cordless table lamps make it covenient for outdoor and home decoration. 【Soft Nursey Lamp】 Energy-efficient LED table lamps create a fliker-free and comfortable light. Adjustable lighting color between warm yellow and cool white to creat the ideal sleep environment for your baby and families . A best baby nursey lamp to care eyes and save money. 【Touch Control and Memory Function Moon Lamp】 Two brightness levels settings of dim to bright, white and yellow lighting color to match your mood or any occasion. Easily adjust brightness and color by taping the smart touch on buttom . The touch lamps add memory function to save last setting for convenience. 【3D Printing Technology】 The nightstand lamps is delicately crafted with 3D printing technology, restores the real appearance of the moon vividly. Unique moon shape makes the room full of fun, cute gifts for childrens or baby. If you have any questions about this product by ACED, contact us by completing and submitting the form below. If you are looking for a specif part number, please include it with your message.